Defense Secretary Michael Fallon has warned that a Labour government would give up Britain’s Trident nuclear weapons program to secure power with the Scottish National Party (SNP). Fallon launched into a blistering attack on Labour leader Ed Miliband, accusing him of treating Britain’s security as a “bargaining chip” to gain power in the general election. Fallon’s comments come as SNP leader Nicola Sturgeon pledged during a BBC Scottish leaders debate on Wednesday night that her party would only prop up a Labour minority government if they agreed to scrap the Trident nuclear deterrent. With Labour’s traditional support in Scotland reportedly collapsing, the SNP is set to become kingmaker in the event of a hung Parliament, when no party gains an outright majority of seats. Both Sturgeon and former SNP leader Alex Salmond have made clear their willingness to support a minority Labour government on an unofficial basis. While Miliband ruled out a Labour-SNP coalition in March, he did not reject an informal arrangement which would take place on a vote-by-vote basis. The Defense Secretary waged a blitzkrieg-like assault on Miliband on Thursday morning, attacking him in a speech, a BBC Radio 4 interview, and an article for the Times. Fallon sought to underline two key messages in his onslaughts. Firstly, that Miliband would threaten Britain’s security to gain the vital support from SNP that a minority Labour government would need to govern. Secondly, that Miliband is a “backstabber” who would betray his own country to gain power. He wrote in the Times: “Nicola Sturgeon could not be clearer. She has told Ed Miliband that scrapping Trident – our country’s vital nuclear deterrent – is non-negotiable. Fallon cited Russia’s decision to modernize its own nuclear forces and North Korea’s “defiance of the international community” as reasons for maintaining Trident. “When Britain could face nuclear blackmail by rogue states, the SNP’s naive world view is more suited to a student protest group than a party of government,” he wrote. In a move some political pundits have recoiled from, the Conservative minister resorted to personal attacks against Miliband. “Remember: Ed Miliband stabbed his own brother in the back to become Labour leader. Now he is willing to stab the United Kingdom in the back to become prime minister and put our country’s security at risk,” he wrote in the Times. Some Conservative Party supporters thought he had gone too far with this comment. “They are like a wounded, cornered animal at the moment – they are lashing out. It’s nonsense,” Alexander said. “As Ed Miliband has already made crystal clear, national security is not a matter for negotiation. We support renewal of Trident along with a renewed focus on multilateral disarmament,” he said. “I’d advise Michael Fallon to lay off the personal insults ... and probably spend more of your time persuading your cabinet colleagues and indeed, the Prime Minister, to properly resource Britain's defenses,” he added. Miliband said the Defense Secretary’s comments showed the Conservatives’ election campaign was failing. According to the Press Association, the Labour leader said: “Michael Fallon is a decent man but today I think he has demeaned himself and demeaned his office. Miliband said Labour is committed to renewing Britain’s at-sea nuclear deterrent, but added it was “right to have a review” of the issue in case technology changes. Kate Hudson, general secretary of the Campaign for Nuclear Disarmament (CND), said the Tories were afraid of a “serious debate” on the issue of nuclear weapons. Hudson also pointed to a survey which found that 80 percent of parliamentary candidates from the major political parties oppose replacing Britain’s nuclear weapons. 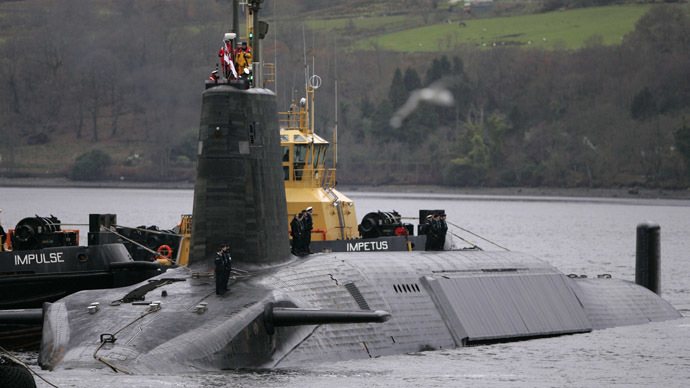 “It's time for the Conservatives and Labour to wake up to the huge public opposition to Trident,” Hudson said. CND will be holding a Vote Out Trident street party outside the Ministry of Defense in Westminster on Monday, April 13. The demonstration will take place from 6 pm to 8 pm, and will feature speakers and performers.